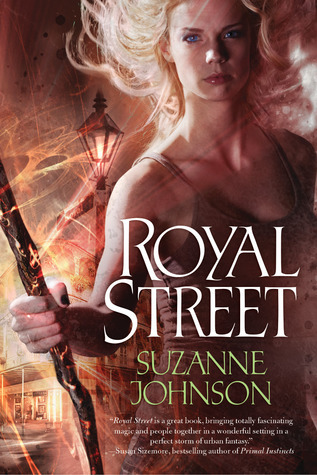 Royal Street is the last of the books I read on my vacation (well, last to review, although it was the first I read, mostly curled up on the couch with my parents’ misbehaved but cuddly beagle), and I think it might have been my favorite. It was a recommendation from The Big Idea way back in April, and although the cover is embarrassingly awful in that way only under-appreciated urban fantasy novels can be, it was a wonderful story that blended the events of Hurricane Katrina with old-fashioned New Orleans voodoo and just the right amount of magic. This is, I think, the third book about New Orleans I’ve read this year. I can’t say I’ve ever read anything about the city before, but each of the ones I’ve picked up have been intriguing. I’m mostly drawn to reading, from a variety of perspectives, about what it was like during the storm and just after, although the city is ultimately more famous for its peculiar brand of raucous southern charm. Having spent very little time in the south, and having never visited New Orleans specifically, I’ve been swept up by the love authors have for this city. I’d really never given the place much thought, since I neither live close enough to visit nor do I have the inclination to fly across the country to see it, but it’s clear that the people who call it home have an understanding of the place that translates beautifully into compelling novels. Johnson, in particular, manages to combine a potent blend of mysticism, jazz, and the ruin of those days following the storm. I found myself drawn into the flooded streets, more curious than I ever have been before about the resiliency of the people who survived the devastation and the efforts of the city’s citizens to reclaim their homes with such poorly organized help from the nation. It was especially wonderful to read her perspective on the few pockets of people able to return home immediately after Katrina, about how the culture of the city survived the demolition of so much of the physical property. It was easy to imagine walking down the deserted streets, only to pass the occasional open bar, strains of Zydeco or blues drifting out on the heavy air. There’s just something inherently magical about such a vibrant place being unexpectedly left empty; it’s impossible not to feel the pregnant pause of the moment when a whole city waits to see its future unfold. Johnson has managed to catch at that tipping point and wrap her whole fictional adventure around a single, deep inhalation of reality. For more about Suzanne Johnson, go here. Nice review! Sounds like a compelling read! It was really fun – I hope you enjoy it if you get around to picking it up!